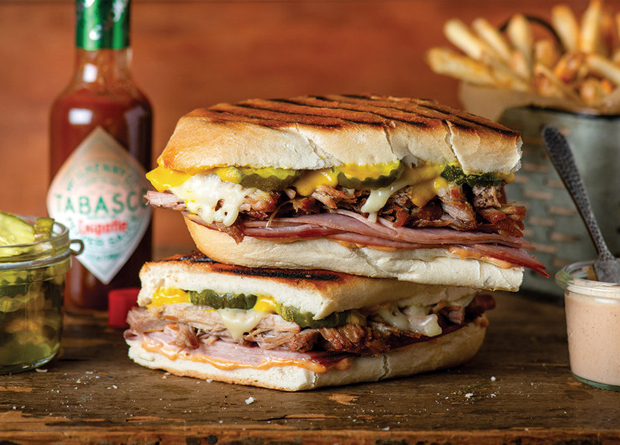 For flavor fans, there is nearly no better combo than the complementary tastes in a Cubano sandwich. Complete with layers of roast pork, ham, soft Swiss cheese, mustard and topped with tangy pickles, all the flavors and textures play in concert. Find his signature sandwich at Sammy’s Beach Bar & Grill at Las Vegas, Cleveland, Maui and Honolulu airports operated by HMSHost, or try creating Sammy’s Cubano Sandwich at home with this recipe. After 45 minutes, reduce heat to 375 F, remove foil and cook 2 hours until internal temperature reaches 175 F and pork is fork tender at thickest part.